The Vancouver Condo Buzz » COMING SOON > New Greater Vancouver Real Estate Projects to Look Out for in Spring – Summer 2012! SIGN UP for A CHANCE at VIP SALES! « From $249,900! Parkside at Victoria Hill New Westminster Condo Tower & Town Homes by Onni > Spectacular Views & Pricing at the New West Parkside Condos & Townhouses Now Launching! Possibly the most anticipated and talked about landmark Vancouver condo tower ever, the new BIG’s designed Beach & Howe Vancouver condominium high-rise is setting the stage for a premiere iconic building that will push the limits in terms of style, design and architecture. The proposed Beach & Howe Vancouver condo tower will be designed by Bjarke Ingels Group Architecture (BIG Architects) that will feature a 49 storey mixed use residential/retail/commercial building. The height of the Bjarke Ingels Group BIG Beach & Howe Vancouver high-rise is set to be around 150 metres, which is the tallest in the south end of downtown and the 4th tallest in the city. The Beach & Howe Vancouver condo tower will feature approximately 600 residential suites for sale as well as 180 market rental units. Also, as part of the project proposal, the Vancouver Beach & Howe tower designed by Bjarke Ingels Group Architects will feature 270 bike parking spaces as well as 713 parking stalls. It will be adjacent to the Granville Street Bridge and will feature a great proximity and walkable score to neighbourhood services, shopping and retail. 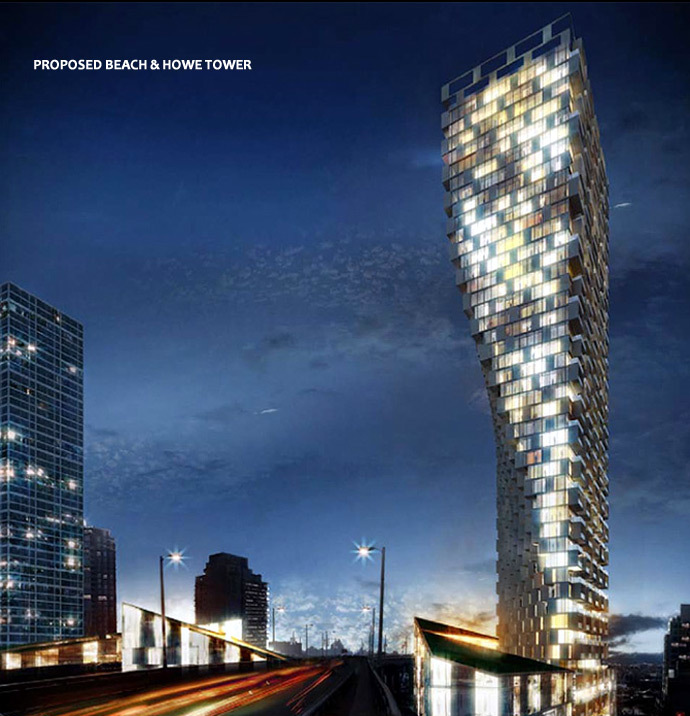 What’s most striking about the proposed Vancouver Beach & Howe condo tower by BIG Architect is the twisting shape of the design, which is very unique to the area. For most Vancouverites, we’re used to the drab cookie-cutter high-rise designs of green/blue glass and rectangular shaped towers. However, the new Beach & Howe Vancouver landmark condo tower will give the skyline a much needed boost in terms of recognizable and beautiful architecture. Stay tuned for more information! Downtown Vancouver West End condos are hard to come by either for home buyers or renters. This new Amacon Vancouver Modern Condos are located in the established and very sought after West End Vancouver real estate neighbourhood, which makes it one of the most highly anticipated and amazing projects in 2012. Located at 1001 Harwood Street Vancouver Modern condos in the West End will feature 118 units with affordable pricing starting from the mid $300,000s. The VIP sales events are likely to begin in mid Spring with eventual completion of the West End Vancouver Modern condos around mid 2014. The Modern Vancouver condo Tower is 19 storeys in height and will feature studio suites to 3 bedroom West End Vancouver penthouses for sale. Some of the interior features for the West End Vancouver Modern condos includes Bosch appliances, engineered wood floors, wool carpeting and great open concept floor plans. Also, all homes at the West End Vancouver modern condos will feature cooling and heating, a rare find in this neighbourhood. Register today for more information about the West End Vancouver MODERN Condos. Following the success of the Opsal Steel redevelopment in South East False Creek, BASTION Developments will turn their attention to a new project next door. Located at East 2nd Avenue and Ontario Street, the Vancouver PROXIMITY False Creek condo tower will blend seamlessly into the neighbourhood with an industrial look and feel that is modern and sophisticated. Just minutes away from the Olympic Village development and waterfront district, the new PROXIMITY Vancouver False Creek condos is likely to start marketing and presales in the Summer 2012. The BASTION Development at Proximity False Creek Vancouver will include green roof tops and solar panels, representing one of the most eco-friendly Vancouver condo projects ever built. Brought to you by Polygon Homes developers, the new Metrotown Burnaby MODA Condo Tower will set the new standard in high-rise living in this metropolitan neighbourhood. The MODA Burnaby condos are located right at Metrotown and Metropolis in addition to the SkyTrain, beautiful parks and Beresford street. Inside, enjoy sophisticated interiors and high-end features including sleek stainless steel appliances and quartz counters. The Burnaby MODA Condos at Metrotown are coming late Spring 2012. VIP REGISTER for MODA Burnaby Metrotown Condos today by clicking here. 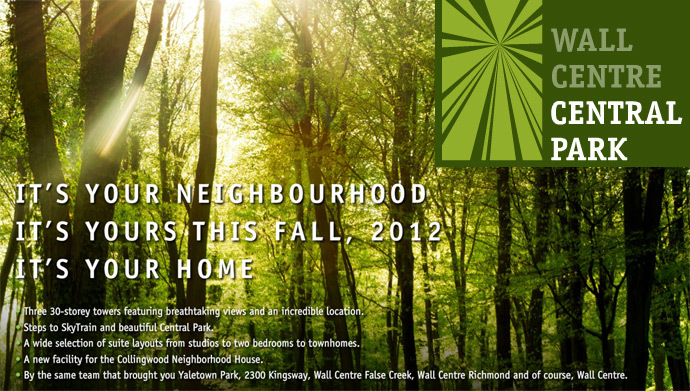 It’s Your Neighbourhood > It’s Yours this Fall 2012 > It’s Your Home. The new 3 tower development at WALL CENTRE Central Park Burnaby real estate development is one of the largest master planned condominium communities in the Lower Mainland. The Burnaby Wall Centre Central Park condo towers will include three 30 storey high-rise condominium towers with breathtaking views and an incredible location. Just steps away from the SkyTrain and the beautiful green space, the Wall Centre Central Park Burnaby condos will have a wide selection of suite layouts from studios to two bedroom and townhomes. Also, the Wall Centre Central Park Burnaby condo development will be the new home for Collingwood Neighbourhood House. Originally marketed as the Trapp Block in New Westminster real estate market, the Salient Group is now in the process of launching the T&H Condos or the Trapp+Holbrook project. Essentially located at Trapp + Holbrook, the T&H Condos will be upscale residences that will be a modern reinvention of the site with original historic facades from the Trapp Block and the Holbrook Building coupled with contemporary and modern interiors. Get the best of the old and new right here at the Trapp + Holbrook New Westminster project which will feature 20 storeys of panoramic views, modern living in the historic downtown area as well as 100 homes priced under $299k. For great affordability, check out the New West Trapp + Holbrook Salient Group project coming late Spring 2012. Modern 1 bedroom to 2 bedroom and den OMEGA Richmond condos by Concord Pacific developers are coming soon in the late Spring 2012. Located within the new master planned neighbourhood called Alexandra Gardens Richmond real estate district, the new OMEGA Richmond condos will be close to parks, restaurants, and lots of shopping. In addition, families with children will be pleased that top ranked schools with great teachers are also located within a short walking distance from the new Richmond OMEGA condos in addition to major transit routes including the bus and SkyTrain. 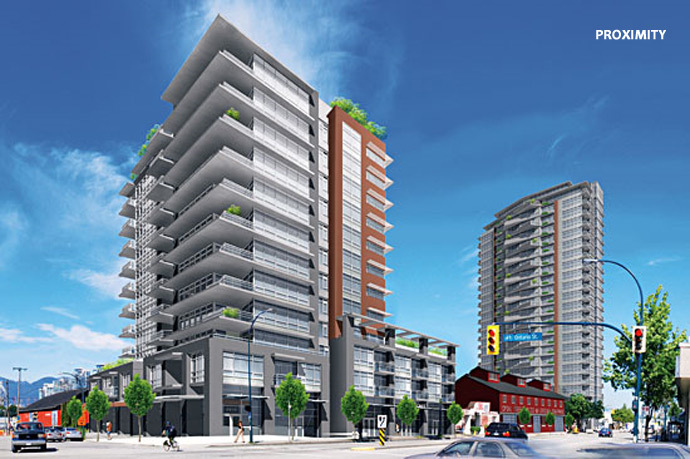 This urban collection of new Richmond OMEGA condos are coming soon! Situated at the corner of Westminster Highway and Cooney Road, get ready for a great project by ATI Investments Ltd called BRAVO Richmond Condos. Luxury and style perfected in downtown Richmond BRAVO condos are coming in late Spring 2012 with expected price points from under $300k. The downtown Richmond BRAVO condos have just launched marketing, but no preview sales event or Realtor event has been confirmed as of this point. 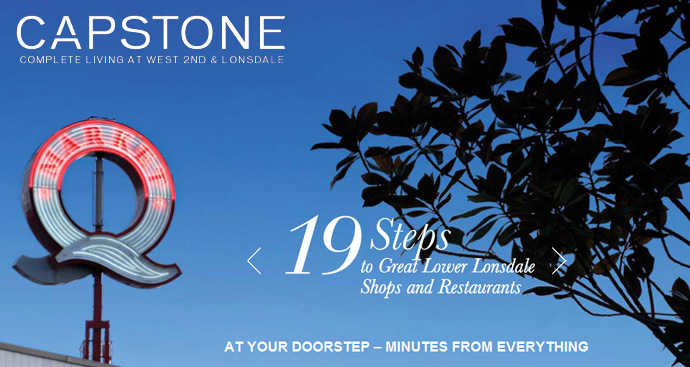 Brought to you by Fairborne Capstone Homes, the newest Lower Lonsdale North Vancouver real estate development features a boutique low-rise called CAPSTONE North Shore Living where you will find an impeccable and exclusive North Vancouver condo development just 19 steps from the great Lower Lonsdale restaurants and amenities. You are just 2 minutes away from the Seabus here at the boutique North Vancouver CAPSTONE condos and the exclusive low-rise will be of concrete construction. The CAPSTONE North Vancouver condo building is only 6 storeys and will be concrete construction. Move in Summer 2013. Surrey City Centre condos for presale are coming soon to the master planned PARK AVENUE Surrey condo tower by Concord Pacific development. Enjoy the ‘club’ lifestyle of five star amenities and a great Surrey City Centre location right here at the Park Avenue Surrey condos for sale where you will find a private club with resort style amenity spaces just for you. In addition to that, the new Surrey Park Avenue condos will also be very affordable, with pricing expected to start either in the high $190’s to low $200’s. 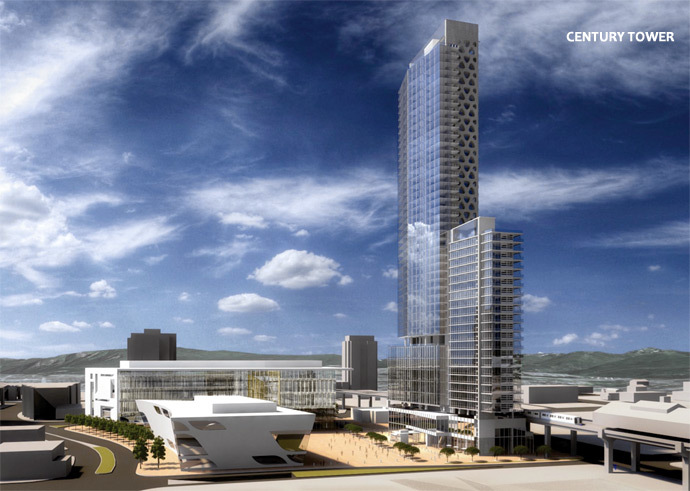 The tallest high-rise outside of Vancouver will be … The new Surrey CENTURY TOWER by Century Group. Situated in the Whalley/Surrey City Centre redevelopment plans, the new Surrey Century Tower will rise 54 storeys in height and is currently going through the planning stages and final approves by the City. The Surrey Century Tower will rise 160 metres and will be the tallest Surrey condo high-rise to date. The 2 commercial tenants already approved for the Surrey Century Tower condo high-rise includes the Century Group (developer) as well as Cotter Architects who may also be in charge of designing this 54 storey high-rise landmark in Surrey City Centre. Previous failed attempts at landmark towers in Surrey have failed, but it seems as though the new Surrey Century Tower condos will be approved. Stay tuned! In planning for more than 5 years and put on hold in 2009 due to the global financial crisis, there are rumblings and rumours that the Century Group will be reviving its plans to build the twin towers at Holland Pointe Surrey City Centre. Featuring a prime location within Holland Park, the new Surrey Holland Pointe condo towers will become Surrey’s tallest high-rises and will also become the landmark towers for this amazing revitalization and redevelopment. The Century Group has just completed it’s successful twin towers at CityPoint and is expected to turn their attention to the Surrey Century Tower as well as the development of the Holland Pointe Surrey condo high-rises possibly with construction even starting in mid 2012. The Holland Pointe Surrey condo towers will be mixed use with ground residential townhouses, condominium residences, lower level retail, office and commercial space. Stay tuned!